Students who attended Nysmith School for the Gifted, a private, preschool through eighth grade institution, have a high rate of success. What exactly is life like after Nysmith? Two alumni currently attending Thomas Jefferson High School for Science and Technology recently weighed in. Maxwell Jones, who attended Nysmith from 2011 to 2015, plans to double major in math and computer science at Carnegie Mellon University this fall. He already tutors other Nysmith students in those subjects. Maxwell scored 35 out of 36 on the ACT and had perfect scores on the math and physics portions of the SAT. He also has experience as a writer and editor for a national origami magazine and has tutored middle school and high school students in several STEM subjects. 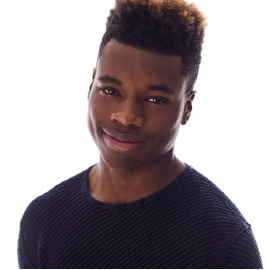 Additionally, Maxwell played varsity basketball for several years, was vice president of his school’s business and science club and participated in a number of other extracurricular activities. Way to go and best of luck in the Nationals! 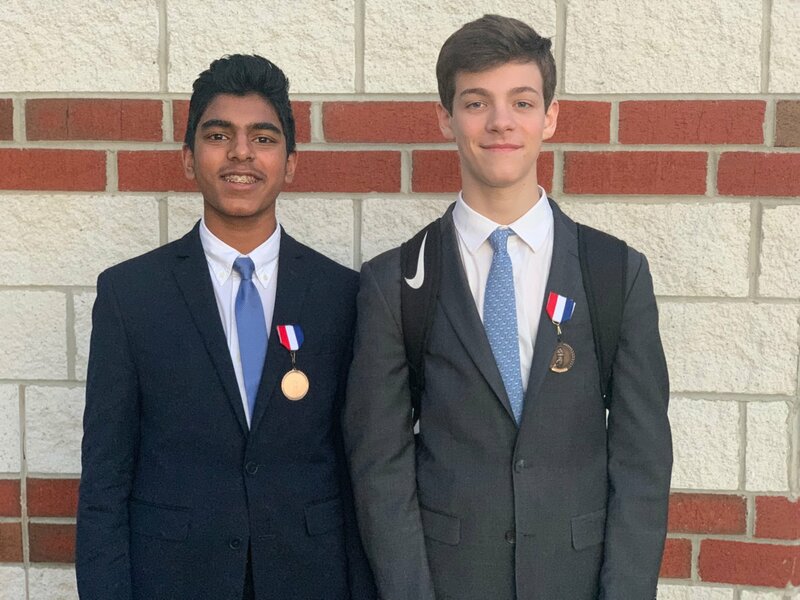 Nysmith students Ben J. and Aaron J. went undefeated in all four rounds in the WACFL High School Public Forum Debate Tournament on Saturday, February 16 at Stone Bridge High School in Ashburn, VA. They placed third in the JV Division. Congratulations!! A record-breaking total of 234 Nysmith students qualified for the 2019 Regional History Bee Competition to be held at Thomas Jefferson High School on February 23! That’s over 100 more students than last year! The National History Bee and Bowl are buzzer-based history quiz competitions for primary and secondary school-aged children throughout the United States. Rather than competing as part of a team, each of these students garnered high enough scores individually, to make it to the regional competition. Way to go!!! 2017 STEM Symposium – The Best One Yet! 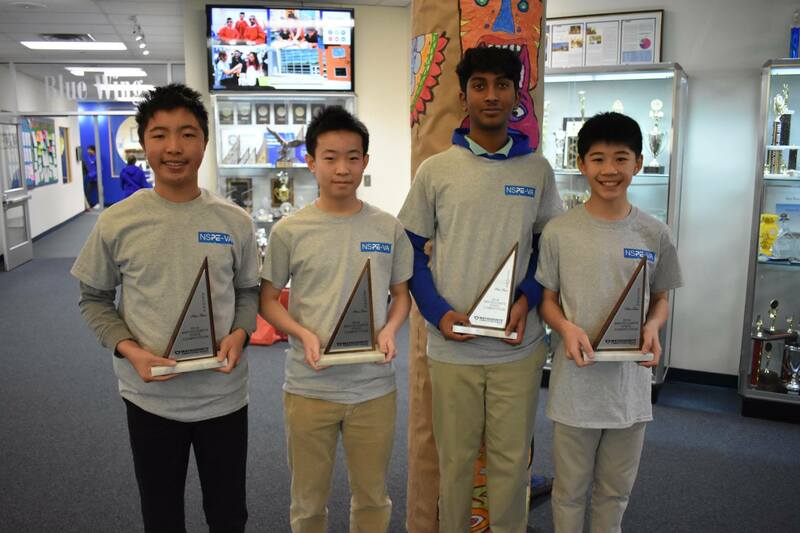 A big congratulations to Nysmith 8th graders, Jeffrey C., Matthew L., Abhi A., and Nysmith 7th grader, Zani X., for taking 2nd place at the Virginia state MATHCOUNTS competition on March 16th. 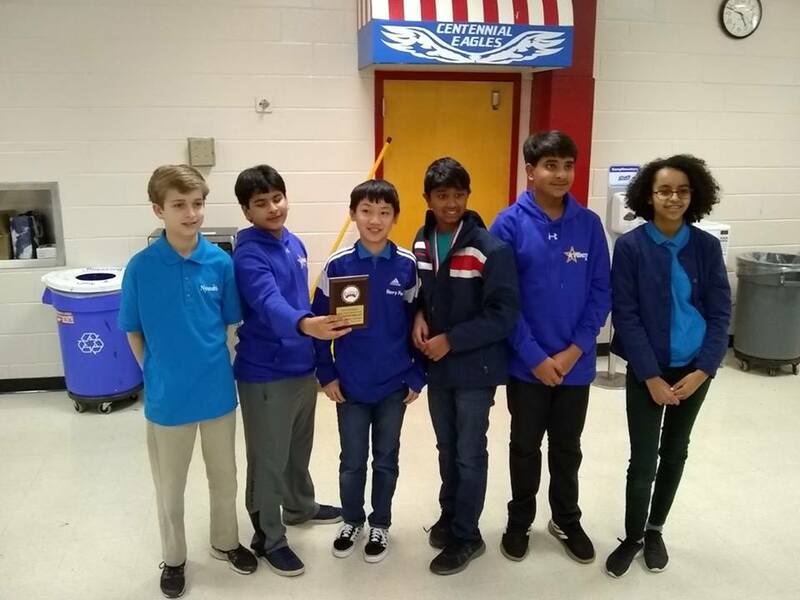 The Nysmith History Bowl team, with a record of 4-2, placed 5th out of 22 teams in the 2019 Capital Region Championship Tournament held March 2nd at Centennial High School in Ellicott City, MD earning themselves a spot in the Quarterfinals. They earned a plaque which is Nysmith’s first History Bowl award. By winning three matches in the tournament and a playoff match, they qualified for the National Finals (details are TBD). 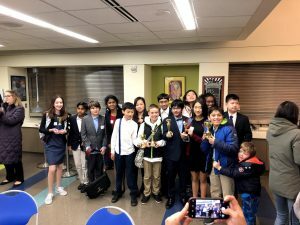 The team was comprised of 6th graders William Strong and Henry Pan, 7th graders Neeraj Madamalla and Amal Wooldridge, and 8th graders Raed Mirza and Andy Rataul. This was our first History Bowl team in three years when one of our teams made it to the National Finals in Chicago and earned an 8th rank in the country. The History Bowl is a team based buzzer competition that models the individual History Bee competition. Teams of 4-6 students compete in matches against teams from other schools. Each match is comprised of four quarters different types of history questions. The history questions, like with the History Bee, cover a very broad range of history. Thus, the students collaborate to study together and help each other prepare. A popular meme has been circulating around the internet. It pictures an illustration of a woman looking perplexed and the bubble above her head reads, “Well, another day has passed and I still didn’t use algebra once!” It’s no surprise that this meme has thousands of likes because so many of us can relate to feeling that math (at least the way we were taught math), seems to be useless in the real world. But that’s just it– if you have a child in elementary or middle school, chances are, you were taught math the “old school” way; through rote memorization, repetition, and endless worksheets. Besides being quite an uninspiring way to learn most anything, educational researchers have found that although concepts can be taught and performed in this way, this kind of learning is one-dimensional. Think of it this way: if a student can quickly fill out a multiplication worksheet, that doesn’t provide much information as to whether he or she actually understands multiplication conceptually. In order to provide students with a deep understanding of concepts, educators have to go further—providing real-world applications and opportunities for students to discover and explore concepts both through collaboration and individually. Here at Nysmith, we’re always striving to provide our students with the most up-to-date and effective learning tools available. In the last few years, we decided that it was time to take a look at the way we were teaching math. Although we had overall student success with our previous program, it had been in place for over a decade and was no longer being supported with features like online accessibility. In addition, we were looking for a way to teach math that was true to the Nysmith philosophy of project-based, collaborative, and experiential learning. 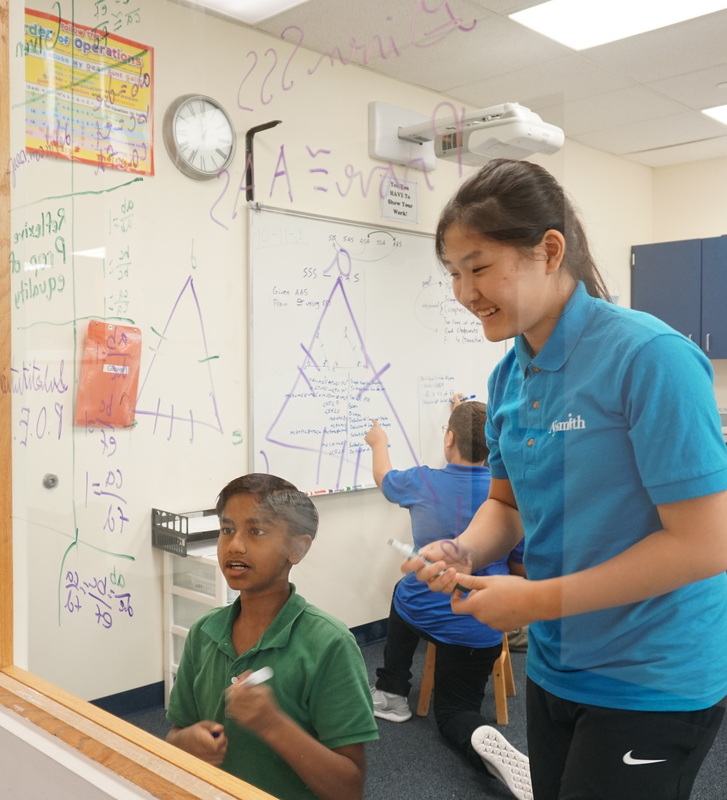 Our upper school math team began the search for a new and improved program with one overriding standard in mind—“find the best.” After months of active search, discussion, collaboration, and research, our team came back with the Carnegie Learning program. Why Carnegie Learning (CL)? In short, CL ticked all the boxes. Based on decades of research by master math practitioners, cognitive and behavioral scientists, data scientists and science researchers, CL was developed as a student-centered approach to math–meant to teach the way students actually learn. Our team found that CL was in sync with our goals of incorporating more teamwork and collaboration into learning, increasing student engagement, and taking abstract concepts and giving them real-world applications. We found that CL understands that problem-solving is not just about getting the right answer, but how you get to the right answer. CL’s cutting-edge program gives students the opportunity to make sense of problems, consider different strategies that could lead to a solution, and finally, determine if their solution proves viable. Their program offers real-world tasks to help empower students to develop the problem-solving skills they will need beyond the classroom. In addition, CL has an online complement to its classroom learning. With Mathia, students get a 1-on-1 tutoring experience that provides real-time feedback, hints, step-by-step problems, a progress bar, and other tools to help students take ownership of and guide them through their mathematical progress. Finally, CL is proven. In an independent study funded by the U.S. Department of Education and conducted by the RAND Corporation, CL’s blended approach nearly doubled growth in performance on standardized tests relative to typical students in the second year of implementation. In addition, EdReports.org ranked CL #1 in Blended Learning Math Solutions. Once Nysmith made the decision to partner with Carnegie Learning, our math team had two full days of immersive training with the experts at CL. During training, teachers spent one whole day working (as students) through various lessons and units. The second day was spent learning and getting familiar with all of the teacher resources available with CL, including online professional development. For more information and to learn more about CL, click here to visit their website. 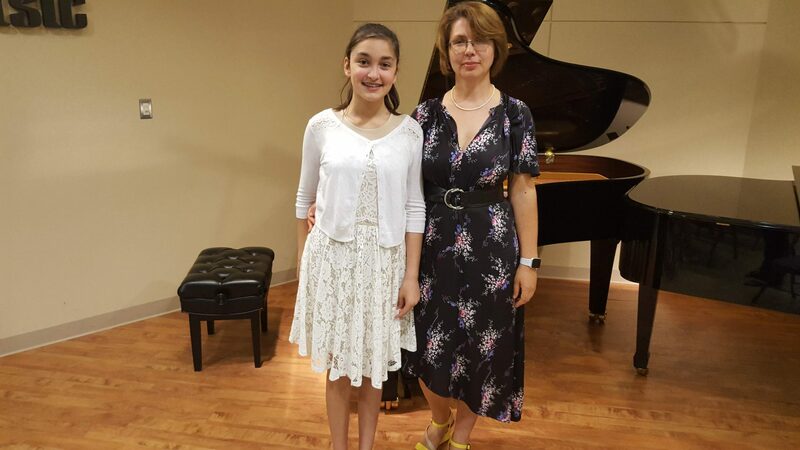 Our very own, 8th grader Ava Ghods, has again received the high honor of Center Certificate of Excellence and State Certificate of Excellence (Virginia) awards for her performance on her piano practical examinations at The Royal Conservatory of Music. According to The Royal Conservatory, “Every student who participates in Royal Conservatory Certificate Program examinations who receive a minimum of 80% on their practical examination and has completed the theory co-requisite for their respective level and discipline, is eligible to win these awards each academic year…”. However, only one student receives the distinction at each level: Center, State, and National. Ava will receive her official award certificates for Piano Level 8 in January which includes an invitation to the Celebration of Excellence events early next year. The Nysmith community celebrates Ava’s artistic talents and recent accomplishments! 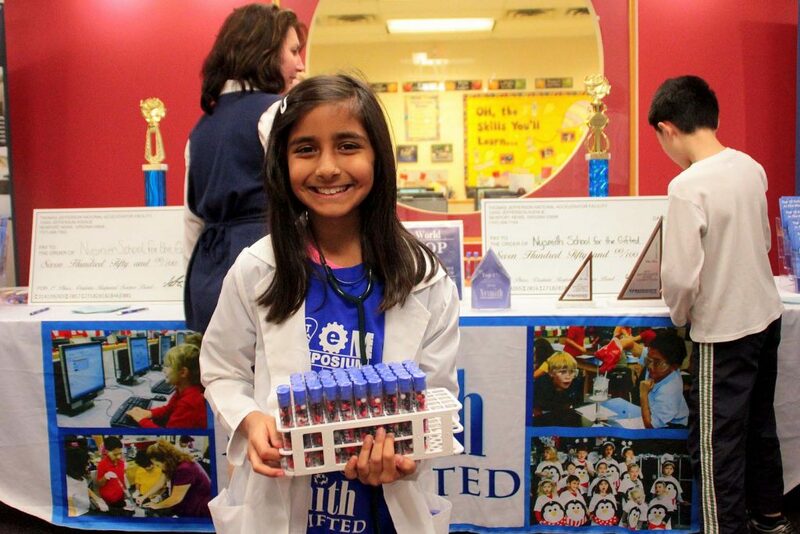 Congratulations are in order for eighth-grader, Ayana Ahuja. Ayana started her own non-profit company called Wags ‘N Barks. Wags ‘N Barks is operated, fulfilled, and serviced by Ayana, and all of the proceeds are 100% donated to Animal Charities. 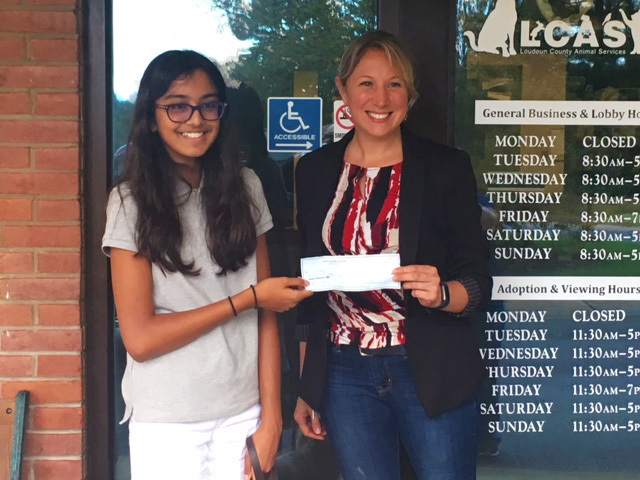 She recently donated $1,000 to Loudoun County Animal Services to help cover medical treatments and sponsor donation fees for older dogs. Way to go Ayana! For the next two years, she volunteered at the symposium through the Children’s Science Center. Now a sophomore at Thomas Jefferson High School for Science and Technology, Kirthi is the founder of SheSoft, a nonprofit that aims to bridge the gender gap in technology by supporting young girls. Begun in 2013, the symposium is designed to help bridge gaps in the workforce pipeline by introducing the tomorrow’s workforce to today’s opportunities. Nearly 5,000 attendees are expected, in addition to more than 50 exhibitors, at least 20 student showcases and numerous speakers. 6,921.22 miles away from Herndon, Virginia, hundreds of athletes from 92 different countries have gathered to compete in the 2018 Winter Olympics. A lot closer to home, there was plenty of comparable spirit, enthusiasm and skill – albeit more mental than physical – on display at the Nysmith School for the Gifted as students, representing 55 different national backgrounds, participated in their own Winter Olympics Theme Day. Staff and students dressed in a variety of sports regalia to go for the educational gold as each class undertook lesson plans that incorporated Olympic-related activities. The second-graders in Ms. Jones’ class were busy measuring distances achieved in such events as marshmallow “snowball” tossing, ice cube luge runs and even marble curling. The kindergarten science room gang were working on their hypotheses (and yes, they did use that word to describe their theories) as they tested whether a variety of items might or might not slide on homemade mini-ice rinks. The third graders got in on the action, as well, applying factoring mathematics to a number of Olympic events and moves. The seventh grade environmental sciences class used their study of earthquakes to construct an Olympic stadium model designed to withstand the effects of quake waves. These young scientists/architects are planning ahead for the 2020 Summer Olympics that will be held in Tokyo, near the fault line of two geologic plates. It wasn’t all classroom action, though. One half of the gym was converted into a pseudo hockey rink, while the other half hosted a Nysmith version of the biathlon competition, with students cross-country “skiing” and then taking aim at a line of targets set up on the auditorium stage. Whether they are participating in the academic arenas or in fields of physical activity, the Nysmith students give it their all. “When we say ‘learning is fun,’ we all really mean it,” said school director Ken Nysmith. Shouts of “Yes!” “Got it!” and “Score!” from the classrooms and the sporting venues seem to echo through the hallways in agreement. More information about the school is available at www.nysmith.com and on Facebook. 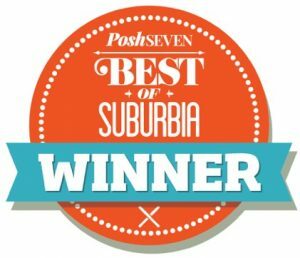 PoshSeven readers have once again voted The Nysmith School a best private school in Northern Virginia! In the PoshSeven 2017 “Best of Suburbia” survey, The Nysmith School was award First Place in both the “Best Private Preschool” and “Best Private Kindergarten” categories. We are honored that the community thinks so highly of us! Michelle Marsh of WJLA/ABC7 came to Nysmith to interview eighth-grader Alex Misiaszek about his dedication to community service for their “Inspire” series. Alex has combined his passion for service with his love of music and has been performing piano recitals for seniors in hospitals and nursing homes all over the DC area. He said he loves the impact it has on his audience, both physiologically (classical music benefits the brain) and psychologically (it makes them happy!). He said his family is very proud and supportive, and that he gets a sense of satisfaction from making a difference and inspiring others to develop a love for performance and a love of service. 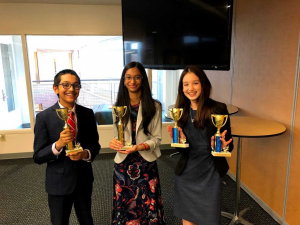 Two Nysmith School eighth-graders – Alex Joel of McLean and Caroline Huber of Great Falls – won the championship in the novice division of the recent D.C. Urban Debate League High School Tournament. 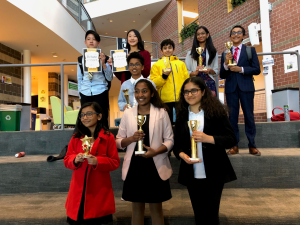 A Nysmith School team consisting of sixth-graders Raed Mirza of Great Falls and Sankrith Ramani of Herndon won the middle-school division of the recent D.C. Urban Debate League tournament. A team consisting of Cameron Hiek of Great Falls and Anvi Kalyana of Herndon finished third in the competition. And find more coverage on Alex and Caroline in the Sun Gazette here (turn to page 15). Kathuria (Fairfax), Veer Dabbi (Oak Hill) and Austin Greene (Great Falls). Aanya Kolli (of Chantilly), August Rame (Washington, D.C.), Melis Ozdemir (Arlington), Sahithi Atluri (Centreville) and Valentina Suarez (Leesburg). (Great Falls), Sarang Arun (Fairfax), Michaela Joyce (Sterling), Neha Regi and Rohan Regi (Centreville). 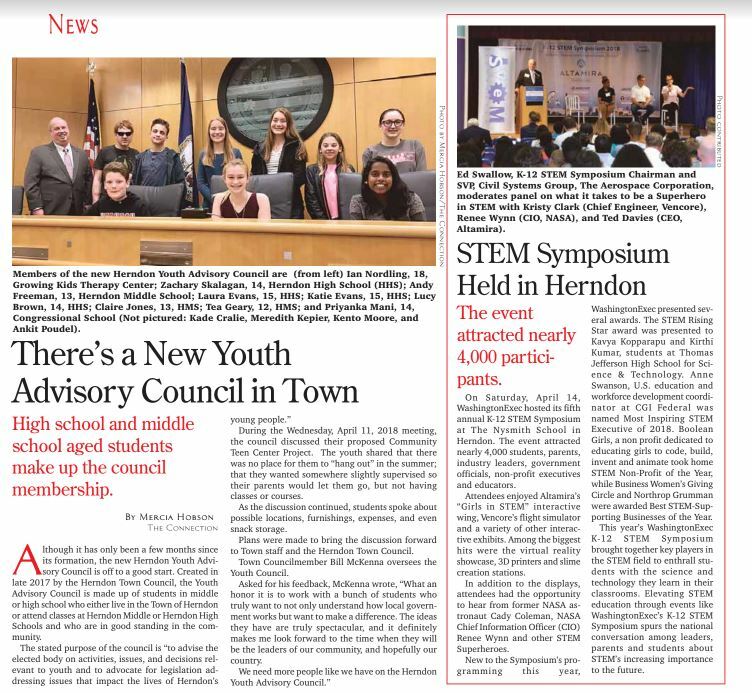 See a PDF of the article in the Oak Hill/Herndon Connection here. On Saturday, March 25, 2017, The Nysmith School hosted WashingtonExec’s Fourth Annual STEM Symposium, and it was the biggest and best one yet! A record-setting 3,600 attendees, including educators, industry experts, parents and students, showed up for this year’s symposium. 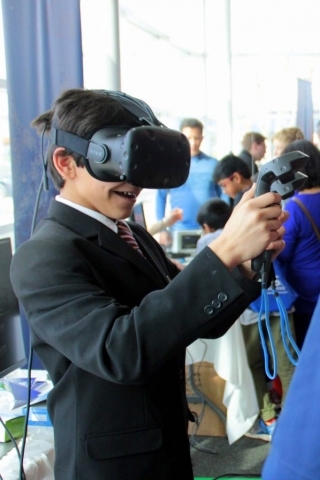 It’s the largest annual gathering for STEM in Northern Virginia. The morning was kicked off by our own Ken Nysmith with a warm welcome and opening remarks. Congresswoman Barbara Comstock (R VA-10) and Congressman Gerry Connolly (D VA-11) gave keynote addresses about the importance of STEM education and, following their speeches, walked around and talked to many Nysmith students about their science fair projects. Former Nysmith student Aadityah Singh, currently a sophomore at Thomas Jefferson High School and rising freshman at M.I.T., was part of a panel discussion on “Opportunities in STEM,” led by Dr. Evan Glazer, Principal of TJ. Highlights of the day include a flight simulator brought by Vencore and LGS Innovations’ station where kids learned to reverse engineer remote-controlled cars. LGS’ virtual reality showcase was popular among the grown-ups — as was the Tesla Model X in the parking lot, which has the hardware needed for full self-driving capability at a safety level substantially greater than that of a human driver. Truly amazing. The kids’ winner of the day was… SLIME! The Blue Wing of the school was 100% dedicated to “Girls in STEM,” and at Altamira’s booth kids learned all about chemistry by playing with goo. 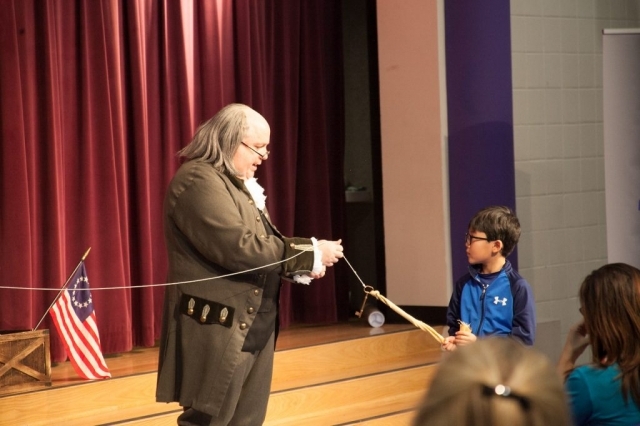 Another top attraction was the Benjamin Franklin impersonator. Franklin is often thought of a simply a founding father of our country, but his endeavors in the STEM universe can stand as inspiration to everyone. Last but not least, Thomas Jefferson, a.k.a Tom, in his #3 Washington Nationals jersey, took to the blacktop at Nysmith and raced kids of all ages! It was a special treat for all of us here to see so many current and former Nysmith families in attendance. Many thanks to all. If you weren’t able to attend this year, you can look forward to 2018. WashingtonExec has a great “Parent STEM Action Plan” that you can download to help you nurture your child’s interest in STEM. Go to http://stemsymposium.com/parents/ to get your copy. 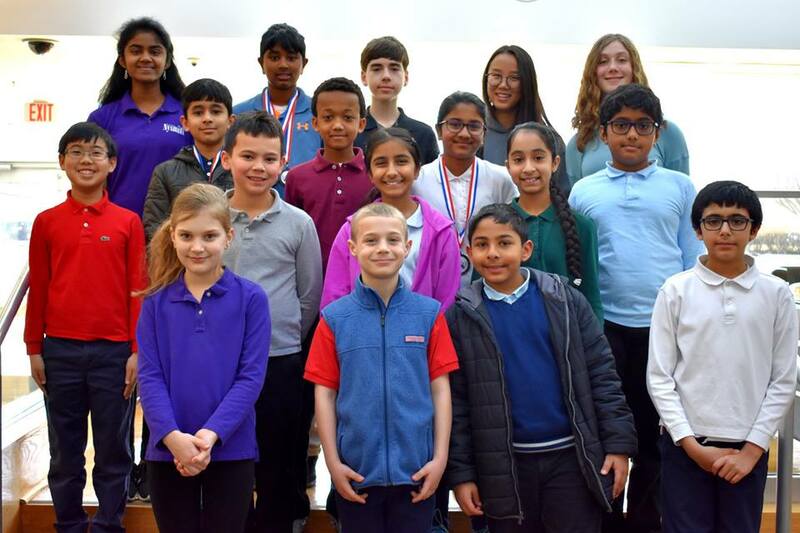 The most recent accomplishments of individual students and student teams from The Nysmith School for the Gifted continue a string of competitive achievements. Several Nysmith debaters scored impressive results in recent competitions. Among the students competing in this past weekend’s DC Urban Debate League Tournament, coached by Marlene Laro of McLean: Alex Joel (eighth grader from McLean) and Caroline Huber (eighth /Great Falls), placed first in the Varsity Division. Two sixth graders, Aaron Joy of Herndon and Ben Joel of McLean, emerged victorious in the Novice Division. Another group of Nysmith debaters took third place in the Holy Trinity Public Forum Debate Tournament. 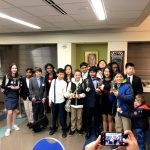 Under the direction of coach Maria-Theresa Dragg of Herndon, the winning team includes McKenzie Hiek (seventh grader from Great Falls), Sarang Arun (seventh/Fairfax) and Emma Jing (seventh/Oak Hill). 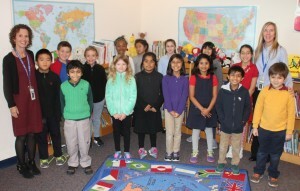 Herndon — A fourth grade team from The Nysmith School in Herndon achieved Highest Honors in the recent WordMasters Challenge—a national vocabulary competition involving nearly 150,000 students annually—scoring an impressive 185 points out of a possible 200 to place third in the nation. Nysmith School for the Gifted seventh-grade student Kaien Yang, 14, won the Marconi/Samueli Award for Innovation at the sixth annual Broadcom Math, Applied Science, Technology, and Engineering for Rising Stars, or MASTERS, science fair held Oct. 29 at the National Geographic Society in Washington, D.C.
His winning app, iDiagnostic, analyzes the shrinkage or extension of various parts of the brain to determine the likelihood a patient might have depression. The award came with $10,000, which Yang plans to save most of it for college. Yang developed the idea for his project after his mother underwent brain surgery for an aneurysm in 2011. That experience, along with a time when his grandfather got headaches and mood swings from a shrinkage of his cerebellum, prompted his interest in neuroscience. He plans to expand on his iDiagnostic project by researching neurotransmitters. Yang hasn’t committed to neuroscience as a potential field of study for his long-term future and lists astrophysics, math and chemistry among his other interests. Yang was selected as one of 30 finalists in the 2016 competition. A panel of scientists and engineers culled those finalists from 300 semifinalists and 2,342 total applicants from around the country. The Broadcom Foundation and SSP organize a yearly, national science fair for sixth, seventh and eighth grade students to support their interest in STEM fields. See the article on WashingtonExec.com here. 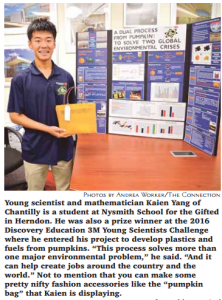 The next time you hear someone bemoaning the “state of today’s youth,” please direct their attention to Kaien Yang of Chantilly and Alex Misiaszek of Ashburn, two 13-year-old students at the Nysmith School for the Gifted in Herndon. USING PUMPKINS to produce plastic and fuels will significantly reduce pollution, but of equal benefit is that growing the pumpkins and processing them into these materials “can bring jobs to a lot of rural areas in our country, and in other countries where people struggle to find or create work,” said Kaien. Pumpkins can expand from a mostly seasonal product, to a year-round source of income, from the farm to the processing plants. Not content with just tackling world ecology and economy problems, Kaien is also competing in the Broadcom MASTERS (Math, Applied Science, Technology & Engineering for Rising Stars) with only 30 other finalists at the National Geographic Society here in D.C. “iDiagnostic: Invention of an Early Detection Tool for Major Depressive Disorder” is his topic this time. With this project Kaien went for more of the math versus the science, and looked to benefit the individual first, by developing an algorithm to help diagnose depressive disorders. After devouring 150 research papers on the subject, Kaien went to work “but I hit a wall. My app just didn’t work.” Of course, he didn’t give up. With some mentoring from his Nysmith math teacher, JoMarie Broccoli, he started again, and the result was a test that showed a 94 percent reliability rate when tested against people who have been diagnosed positively for these conditions. Alex Misiaszek’s current project is a bit more hush-hush in its details. He’s not in an official competition with his work, but instead, is collaborating with folks at the Baltimore Underground Science Space (BUGSS). This unique facility is a place where “people from all walks of life come to learn and practice biotechnology, a laboratory for use by amateur, professional and citizen scientists.” For Alex, it represents a place where he can get his hands on equipment and materials he needs in his research and use a variety of tools safely and with supervision. So far, so promising. 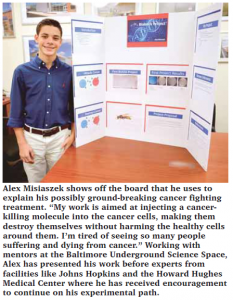 He presented his early works and findings at a speech attended by researchers from the University of Maryland, Johns Hopkins and the Howard Hughes Medical Center (remember – he’s 13!) where the response was overwhelmingly encouraging. In between his classwork and his private research efforts, Alex is looking ahead to high school and has already started applying at institutions like the Sidwell Friends School and Georgetown Preparatory. The “state of today’s youth?” In pretty good hands like those of Kaien and Alex. Kaien Yang had a family member who was prone to mood swings and bad headaches, and his parents explained that there was something wrong with his relative’s brain — the man’s cerebellum had shrunk. The brain has long fascinated Kaien, 14 — “It’s only three pounds of matter, but it’s so exquisite” — and his interest deepened when he accompanied his mother, Fengrong Li, to doctor’s appointments at Johns Hopkins Bayview, where she received treatment for a brain aneurysm in 2011. He looked curiously over brain scans, and he once brought along one of his favorite books, “Gifted Hands,” the autobiography of neurosurgeon and former presidential candidate Ben Carson, and was elated to meet his idol. With his late relative’s struggles as inspiration, Kaien has developed a diagnostic app that aims to identify the probability that a patient will develop depression based on changes in the hippocampus. He did extensive research to figure out what changes in the brain are related to depression. 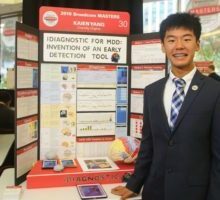 Kaien’s project earned him a $10,000 prize from the Broadcom MASTERS competition, a national science competition for middle schoolers. 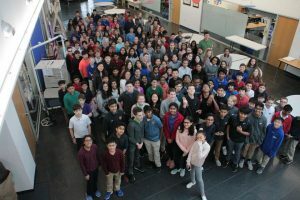 It is the middle school version of the oldest and most prestigious high school science competition known as the Regeneron Science Talent Search. 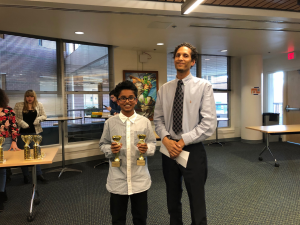 Kaien, an eighth-grader at the Nysmith School for the Gifted in Herndon, Va., is one of two Northern Virginia middle schoolers to earn an award in the competition. Eleanor Wren Sigrest, a 13-year-old eighth-grader at Benton Middle School in Manassas, Va., won the top prize of $25,000 for her research on the nozzles of cold gas rockets, which are used to stabilize spacecraft as they land. Out of about 2,300 competitors nationwide, just 30 middle schoolers made it to the final round of the competition, a multiday science fair that included science-related challenges. Competitors were judged on their research projects and on their ability to work in teams and collaborate in the competitions. The competition is designed to groom the next generation of scientists and to inspire youngsters to pursue careers in science, technology, engineering and math (STEM). Organizers hope that young scientists such as Kaien, Eleanor and the competition’s two other winners — 15-year-old Aria Eppinger of Pittsburgh, and Nathan Deng, 14, of San Marino, Calif. — will be leaders in science and innovation. Eleanor, like Kaien, found inspiration for her project in real life. Eleanor’s father, Wren, is a former engineer, and her crowded home in Woodbridge, Va., doubles as a makerspace, replete with art supplies, glue guns and even a weaving loom. The busy middle schooler, the third of five children, builds and launches model rockets with her father. Her sister, Piper, is a student at MIT and spent the summer of 2015 interning at SpaceX. Eleanor once sat glued to a laptop watching riveting footage of a failed landing of a SpaceX rocket that was equipped with small, cold-gas rockets, which are intended to help guide it into position as it lands. The nozzles, which have a narrow and a wide end, are often designed with 15-degree half-angles, a measurement that had become a sort of engineering “rule of thumb,” Eleanor said. Eleanor wondered if there might be a better half-angle, if a nozzle that had a proportionally wider or narrower end would produce better thrust. She designed a series of nozzles and built them on a 3-D printer and then tested them. Her findings? Nozzles with a 20-degree half-angle produce the best thrust. She hopes to follow her sister to MIT, using the prize money toward tuition. But she has grander dreams after that, and she hopes the top prize will give people confidence in her abilities. “I’m going to show the world that I’m going to be the first person on Mars,” Eleanor said. Kaien said he, too, is saving his prize money for college, hoping to attend Stanford or Yale. But first, he wants to refine his app and get it to doctors, who could use it to gauge a patient’s risk of depression and potentially get them a diagnosis earlier. We are excited to begin another wonderful academic year! We sat down with Ken Nysmith of the Nysmith School for Gifted and Talented children and picked his brain a little about homework. Do you fine tune your program each year? Ken Nysmith: We have been busy this summer, preparing the building and fine tuning our program. We genuinely appreciate all the feedback that everyone provided to us on the surveys toward the end of last year. We spend a lot of time looking at the survey results, analyzing where we could improve. 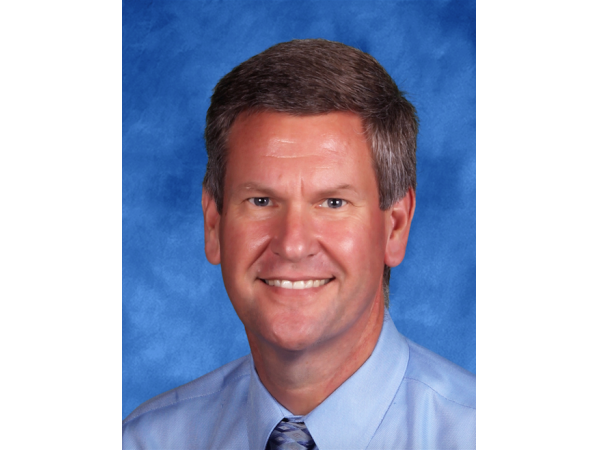 I am confident that you will see changes that we have implemented as school progresses. What are your thoughts on homework? KN: One of the keys to ensuring your child will be happy and challenged is to clearly communicate expectations. When it comes to homework, we firmly believe that children should not have more than 10 minutes of homework per grade, 4-5 times a week. So a third grader should not have more than 30 minutes of homework 4-5 times a week. We urge parents to let us know if it is taking your child longer than the time we have allocated. We really want every family to be able to balance outside interests and family time with academic requirements. Do you recommend a good outside resource on the topic of homework? KN: A great resource is Ann Dolin’s book Homework Made Simple. Ann is the first speaker in the PTO Parent Education series this year on September 30th and we urge our parents to attend. She will speak about the best study strategies and how to start the school year strong. After she speaks with parents, Ann will talk with 7th and 8th graders on the same topic. We try to offer every available resource to our families at our school and anyone can find Ann Dolin here as she is the owner of EC Tutoring right here in Fairfax. We struggle with homework time. How do you recommend we talk to our kids about homework? KN: I urge every parent to spend a couple of minutes thinking how best to help your child develop the independence, organization, and study skills they will need to be successful in the future. While we do not believe that children need a lot of homework and repetition, many high schools still do. Our alumni consistently report that they are better prepared for the increased homework volume of the high schools because they were able to develop their time management skills and responsibility while they were at Nysmith. It comes down to teaching your kids time management skills and keeping an open door for communication between you, your child and their school. We are always sucked into do the homework with our kids. What do you recommend we do for homework time to allow our children to work independently? KN: We ask that parents set up an area where a parent can observe their children doing their homework. We ask that parents verify that students are not distracted and put forth their best effort working on their homework. I would encourage families to set up homework time early in the evening, if at all possible, so children have free time once their work is completed. If you have any questions, please do not hesitate to contact us. We are here to help you and your child. We truly want your child to love school, and while we realize that homework may not be their favorite part of the day, building the responsibility in a happy and nurturing way during these early formative years will pay dividends for the rest of their lives. Nysmith Private School for Gifted and Talented Education for Students. Preschool, Elementary Primary School and Middle School. Small class sizes and low 9:1 or less student to teacher ratios facilitate the diversified curriculum. By incorporating Daily Computers, Science, Math, Language Arts along with Logic, and Foreign Language, PE, Video Editing, Art and Music we are able to expand the children’s academic opportunities and make School Fun. By eliminating needless repetition and diversifying the academics, we are able to accelerate to meet each child’s academic level needs, while promoting their social wellness. Early academic nurturing promotes a love for learning and success in life. Come Tour and see what makes Nysmith School for the Gifted so Special. Alex Joel, a McLean resident and seventh-grade student at Nysmith School in Herndon, was accepted into his school’s chapter of the National Junior Honor Society when he was 12 years old. His first obligation as a member: to complete 20 community service hours. This sounds like a straightforward task, one that most students undertake either as a school requirement or a personal goal, but Alex soon discovered that it wasn’t quite as easy as he expected. Inundated with information and options, Alex spent hours online trying to find the right volunteer opportunity, according to his mother, Marlene Laro. Eventually, he decided there had to be a better, more efficient way to search for community service openings than aimlessly surfing websites that may or may not be relevant to his circumstances. So, putting his budding skills at web design and programming to use, Alex developed the database Communiteen.com along with his 11-year-old brother, Ben, who predominantly assisted with the marketing side of their joint project. “I decided that I would…compile all these [community service] opportunities into one website that would be easy to use and search,” Alex said. Alex expressed an interest in computers long before he started Communiteen, which officially went online in 2015. Laro is a partner and chief operating officer at the model law firm Potomac Law Group. When the firm tasked her with creating a new website, she hired a consultant to teach her and Alex the intricacies of web design. That consultant was Adrian Mikeliunas, a full-time information security engineer who also teaches part-time for the Fairfax County Public Schools (FCPS) adult community education program. Mikeliunas was initially skeptical when Laro called him about two years ago to enlist his help. He helped teach computer skills to his daughters, who are now in college, but otherwise, his instructional abilities primarily extended to adults, not children. However, his doubts dissipated once he met Alex and saw the kid’s enthusiasm for web design and programming. Alex and Ben also learned computer skills through Nysmith, which offers education on computers and technology to all students starting from kindergarten. Before Communiteen, Alex and Ben came up with another website called NewzAngle, an idea they developed because they frequently had to discuss current events in their classes. NewzAngle aggregates news stories related to a wide range of categories, from U.S. and world news to entertainment, sports, science and lifestyle stories, and explains them in a way that’s understandable and friendly to younger audiences. “There are so many news sources, and not all of them are appropriate for kids, so we decided that we would make a place where kids – teens and tweens specifically – could go,” Ben said. They post stories to the site manually since they always review them to make sure they’re suitable, and the boys also invited fellow students to contribute blog posts. After initially starting from a paper newsletter that Ben and Alex handed out to their classmates, NewzAngle gained enough popularity that a reporter from WTOP radio interviewed Alex about the site on Mar. 9, 2015. Though the two students now had experience with building their own website, Communiteen posed a different set of challenges. To start with, it proved more difficult to compile community service opportunities since they might not all be listed in the same places the way that news stories usually are, and they had to sift through a lot of information in order to find the location and eligible ages for each opening, as well as details about what volunteering for different organizations would entail. The layout and design of Communiteen was also heavier on graphics and pictures, which they had to make sure they could legally use. The result is a sleek-looking site that allows visitors to sort entries by location, age and categories, such as administration, animal care, donations, education, fundraising and the environment. Alex and Ben hope that the site will help other students who want to participate in community service but aren’t sure where to start looking or how to narrow down their options. Where Alex primarily worked on the programming side of NewzAngle and Communiteen, Ben helped market the sites. They had a booth at the STEM Symposium that was held at Nysmith in March, and Ben designed business cards, advertising flyers and the site logos. The Communiteen logo features to hands, one blue and the other green, that spread open to reveal the silhouettes of people embedded in each palm. The brothers hope to expand Communiteen in the future, setting their sights on taking it to a national level so that it could help children and teens around the country, rather than just those who live in the Washington, D.C. metropolitan area. Alex says that developing a website has helped improve his ability to solve problems and address challenges, such as fixing glitches and retrofitting or updating old websites. 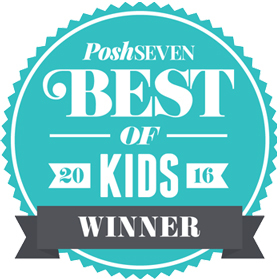 We are so excited to share the news that The Nysmith School has been awarded “Best Private Elementary School” from PoshSeven Magazine in their POSH SEVEN BEST OF KIDS 2016 WINNERS Survey. “The students and teachers at Nysmith School for the Gifted find a true joy in learning and are involved in a variety of engaging educational activities. From preschool to eighth grade, your child will receive a quality education that takes a truly hands-on approach that will prepare them for future academic careers. From grammar, reading, and creative writing to computer programming, science labs, and drama, Nysmith School focuses on learning in a variety of academic and enrichment capacities. Third Annual STEM Symposium draws a crowd at the Nysmith School. That quote came from speaker Eric Schierling as he addressed the crowd packed into the gym at the Nysmith School for the Gifted in Herndon during one of four presentations offered at the Third Annual STEM Symposium. 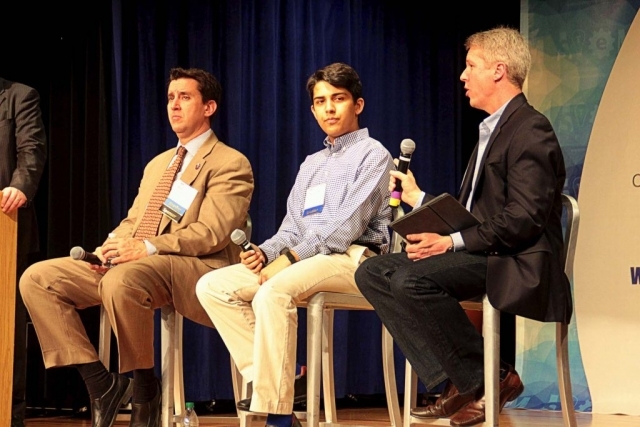 Schierling, a director with Vencore, Inc.’s Space Group and a former Naval Top Gun Pilot, was joined throughout the day-long event by a plenitude of accomplished and engaging speakers, from former astronauts to high school and college students, a U.S. Congressman, leaders from STEM-related businesses and agencies, and school principals and headmasters. Regardless of what position each speaker held, what point in their careers at which they had arrived, or whether they worked for the government, the private sector, a nonprofit, or had yet to complete their studies and enter the workforce, their remarks all contained an echo of Schierling’s statement. Somewhere in each speaker’s address there was a cautionary note that STEM-proficient people are not only in high demand, but in critically short supply. Thomas Jefferson High School for Science and Technology’s (TJHS) principal Dr. Evan Glazer insisted that “we need to keep searching for ways to encourage our STEM-curious young people.” Exposure, encouragement, opportunities and resources are key to developing the “STEM-inclined.” Glazer’s presentation included excerpts and numerous slides that highlighted the STEM fields with the most projected growth for the near future, as well as practical advice for parents and teachers on how to encourage STEM interest, and where to look for support and resources. JD Kathuria, founder and president of WashingtonExec, an online media, membership and events company in D.C, is a staunch supporter of STEM education. He is so convinced that investment in STEM education is invaluable, that he launched the Symposium in 2014 to bring together the best, the brightest and the most involved to elevate STEM education to the foreground of the region’s concerns. IN THIS THIRD, and ever-growing edition of the event attended by some 2500 people, Kathuria and the WashingtonExec gathered sponsors like Aerospace, Vencore and Siemens to achieve the mission of “bringing industry and students together.” In addition to the speakers’ sessions, attendees were treated to more than forty exhibitors filling the hallways and classrooms of Nysmith. Some of the exhibitors, like George Mason University and Sweet Briar College, Nysmith and TJHSST represented formal educational opportunities. Others, like Fairfax Collegiate, Microsoft in Education, Patriots Technology Training Center and STEAMtrix, LLC Learning Program offered outside-the-school term STEM activities, workshops and camps. Nonprofits, outreach groups and organizations run by kids themselves were also on hand. Robotics for Youth, Inc., which occupied a double booth, was manned by some 20 student volunteers, and still had a crowd three-deep waiting to try their hands at operating some of the robots the group had built. The nonprofit was formed just last year by three teenagers – Bharath Maniraj from Fairfax High School, Rishabh Venketesh from TJHSST, and Pranav Sukumaran from River Bend Middle School. “The Bureau of Labor Statistics predicts that there will be a million computing job openings by 2024,” is one reason why co-founder Maniraj took his interest in the field to the outreach level. “We are doing our best to increase awareness among school-aged kids.” The Robotics for Youth gang also serve as mentors for Lego League competition participants. The Children’s Science Center was another exhibitor that attracted significant attention, with hands-on activities and experiments available for youngsters of different ages and abilities – with a few adults who just couldn’t resist mixed in. The Center currently operates at Fair Oaks Mall in Fairfax but is in the planning stage to develop a full-scale, state-of-the art, STEM-centered interactive museum at the Nokes Boulevard exit off of Route 28 in the Dulles area. MENTORING GROUPS were also well represented. LaShaunda Ford who works at Dell, Lauren Medley from Booz Allen Hamilton, and Elizabeth Goodson with Lightower Fiber Networks were pleased to be able to reach so many young women at one venue as they offered information about the “Girls in Technology” mentoring program they belong to. 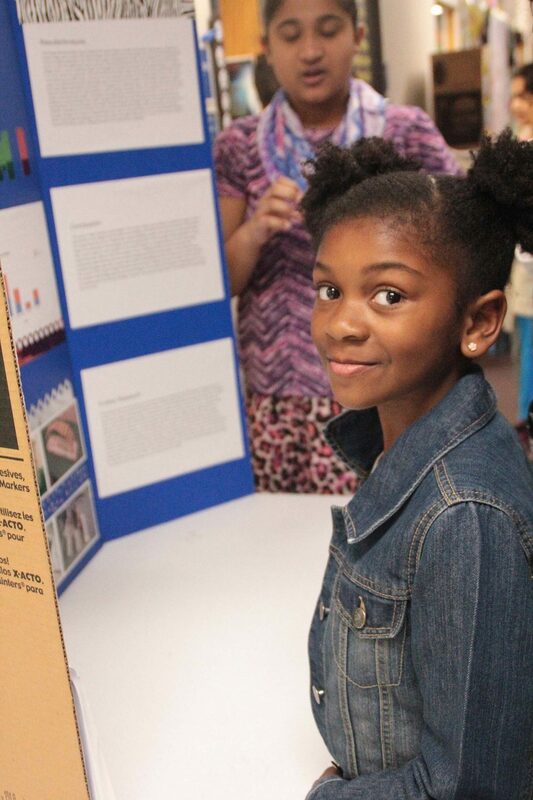 Several local youth were given the opportunity to showcase their competition-bound Science Fair projects and made admirably poised presentations explaining their work from drawing board to finished product, or from hypothesis to practice. 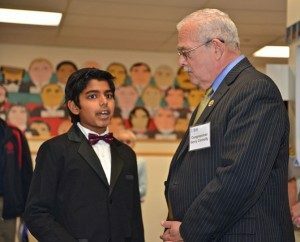 Aaron Joy, a fifth grader at Nysmith, looked calm and comfortable as he discussed his work with U.S. Rep. Gerry Connolly (D-11) who toured the exhibits, demonstrations and projects after his speaking duties at the symposium were completed earlier in the day. 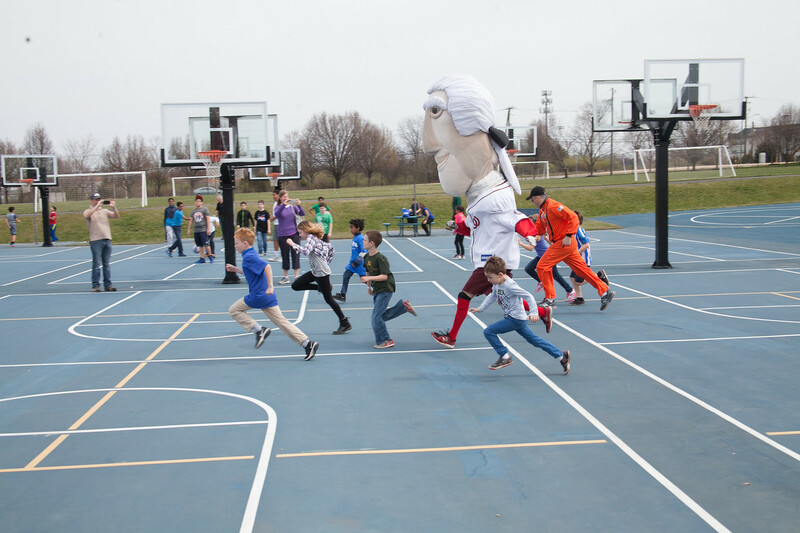 The organizers of the STEM Symposium, mindful of the ages and activity levels of many in their audience, also provided some outdoor adventures, including the opportunity to race against President Thomas Jefferson himself – at least as personified by the Washington Nationals baseball team’s official presidential mascot. There were also flight simulators courtesy of sponsor Vencore, drone displays and “connected” cars with Internet access and other high-tech accessories. The STEM symposium brochure handed out upon check in to the event described the mission of the organizers to be joining “a community of teachers, mentors, parents and local leaders to nurture a child’s curiosity in the STEM fields. Linking science and mathematics taught in the classroom to impactful careers is an ongoing national challenge. Bottom Line: The opportunities for students who are STEM-proficient are endless.” More information, resources, and a Parent-STEM action plan are available at www.stemsyposium.com. Click here to see the article on FairfaxConnection.com. To see more pictures of the exhibits, click here to go to the article on WTOP.com. Herndon’s Nysmith School for the Gifted opened its doors Mar. 12 for the 3rd annual STEM Symposium, a free event aimed at promoting science, technology, engineering and math to children and their families. The symposium featured hands-on exhibits, technology demonstrations, interactive experiments and activities, and a full day of panels and speakers, including Rep. Gerry Connolly (D-VA 11) and former astronaut Dr. Sandy Magnus. Nysmith estimated that the 2016 symposium drew about 33,100 visitors. Organized by the online media company WashingtonExec, the STEM Symposium brings in speakers and vendors from educational institutions, companies and advocacy groups who want to expose students to potential careers and opportunities in science, technology and math-related fields. According to a video titled “America’s STEM education problem” and published on YouTube by the National Math and Science Initiative (NMSI), 69 percent of high school graduates aren’t prepared for college-level science, and 54 percent aren’t ready for college-level math. Thomas Jefferson High School for Science and Technology principal Evan Glazer played NMSI’s video to kick off his keynote speech for the symposium. His speech highlighted the benefits of encouraging students to get involved in STEM-related careers as well as the barriers that prevent many from pursing those subjects. While educators and political and economic leaders frequently point to science, math and technology as crucial areas for development, many careers in those fields struggle to find people with the necessary skills and knowledge to succeed. Recruiting a diverse, equitable workforce also continues to be a challenge. A lack of financial resources and language skills can often be a barrier to underrepresented groups, including black, Hispanic, Native American and low-income people, according to Glazer. NSMI’s video shows that women also remain a minority in most STEM-related fields, constituting 23 percent of all STEM workers even though they make up 48 percent of the U.S.’s overall workforce. Glazer says that it’s also important to support and spread awareness of advocacy organizations that work to make STEM more inclusive, such as the National Society of Black Engineers, Girls Who Code and the Jack Kent Cooke Foundation. A number of these groups were represented at the STEM Symposium, including Project CS Girls, a nonprofit designed to inspire more girls to learn computer science and launched by Nysmith graduate and Harvard freshman Pooja Chandrashekar. According to Project CS Girls, only 25 percent of technical jobs are held by women, while only 12 percent of college graduates who receive a degree in computer science are women, a sharp drop from 37 percent 10 years ago. “We want more women and girls to work in the STEM industry,” Thomas Jefferson student Megan Lin said. Megan is a member of Tomorrow’s Women in Science and Technology (TWIST), a student-led club at Thomas Jefferson that was featured at the symposium. She and other TWIST members ran an egg drop challenge, which required participants to figure out how to prevent a falling egg from cracking using provided materials; a gumdrop dome, where kids engineered domes using gumdrops and toothpicks; and an experiment that used water, oil, food coloring and Alka-Seltzer to demonstrate the different densities and polarities of liquids. Activities like these, along with displays that included drones, self-driving electric cars, and flight simulators, were designed to instill an enthusiasm for science and math in the children who visited the symposium, turning subjects that many people dismiss as boring or too difficult into something fun. 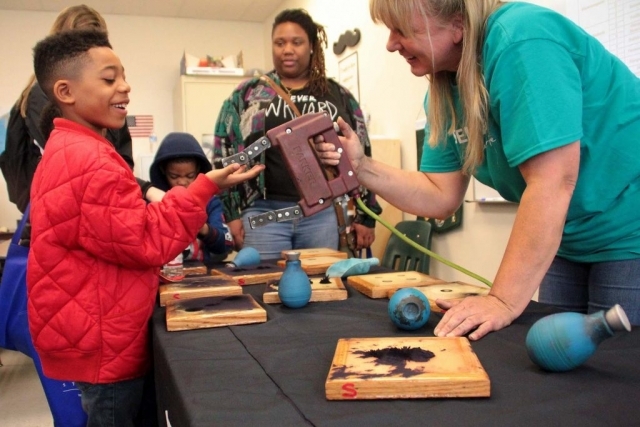 The symposium also gave school officials and potential employers to introduce students to the range of ways they can already get involved in STEM, from classes and summer camps to internships and research opportunities. 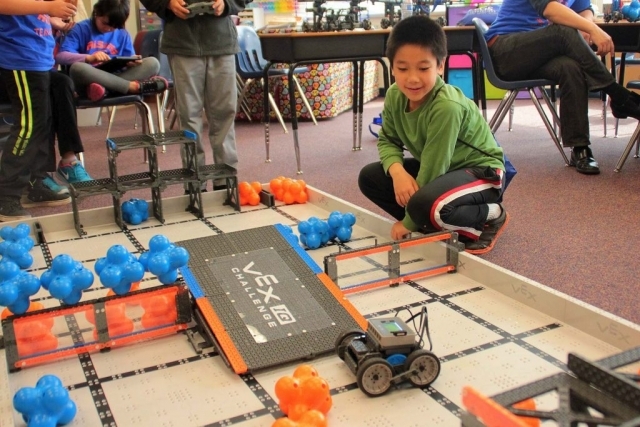 Fairfax County Public Schools offers several summer camps centered on subjects such as technology, robotics and cybersecurity. The county has also started to adjust its curriculum to follow STEAM, which stands for Science, Technology, Engineering, the Arts, and Mathematics and is defined on the FCPS website as a “student-centered, project-based interdisciplinary instructional model.” 60 schools now have STEAM labs, up from only six a year ago. According to Scott Settar, FCPS’s program manager for technology and engineering education and STEAM integration, the county’s changing educational approach is partly guided by schools like Thomas Jefferson and Nysmith that have rigorous standards but are also fairly elite and exclusive. “We’re trying to provide and learn from what they’re doing to provide those opportunities for all students,” Settar said. 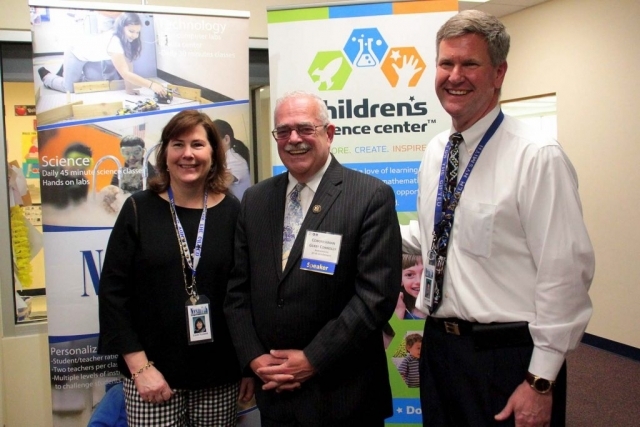 Fairfax County’s implementation of STEM and STEAM labs reflects a national shift in attitudes towards education, which is starting to move away from memorization and strictly classroom-based study in favor of hands-on, real-world application. Settar says that FCPS is working closely with business and community partners to create new pathways for students to enter STEM fields. For example, the county will launch a Global STEM Challenges Program, which integrates math, science and engineering courses, at Edison High School starting next year. 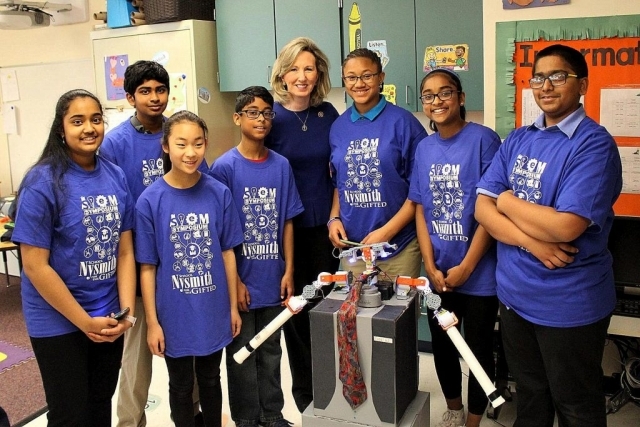 Fairfax County is also working with other school districts to test ways to increase STEM opportunities for sixth graders. The goal of these initiatives and changes is to not only help students learn, but also to provide them with the skills needed to thrive and adapt in an unpredictable future, since the world in a decade could be entirely different than the one they live in today. See the article at the Fairfax County Times online here. These Virginia students love reading, long to travel and have strong feelings about cake. Ilene Kaufman and Brandi Sagilir’s second-grade language arts class at Nysmith School for the Gifted in Herndon, Virginia, is the March Class of KidsPost. Kaufman and Sagilir’s 15 students have a wide range of interests. They enjoy reading fantasy and mystery books, playing soccer, and exploring Web sites with math games. We publish a Class of KidsPost each month of the school year. If you would like your class considered, ask your teacher to download our questionnaire at wapo.st/classofkidspost2015, fill it out and send it, along with a class picture, to kidspost@­washpost.­com. If your class is chosen, we’ll send a KidsPost Chesapeake Bay poster, a book and KidsPost goodies. Favorite author and favorite book: When it comes to reading, these second-graders favored mystery and fantasy books, but they couldn’t pick just one author. Ron Roy and his “A to Z Mysteries” series and J.K. Rowling and the “Harry Potter” books each received two votes. Other fantasy titles included Lloyd Alexander’s “Time Cat” and Suzanne ­Collins’s “Gregor and the Prophecy of Bane.” The kids also enjoy funny books, picture books, sports books and realistic fiction. If you could go on a trip anywhere, where would you go? These students better have their passports, because many are hoping to travel overseas. Australia received two votes followed by a long list of foreign destinations, including Shanghai, Egypt, Paris and Korea. Favorite game or sport: Soccer netted nearly one-third of the votes in this category. Gymnastics and Monopoly tied for second. The most unusual picks: fencing and charades. Favorite birthday food: We could say that cake topped the list, but the kids had specific flavors in mind: lava cake, tiramisu and a giant chocolate cupcake with pink frosting. Other requests included chocolate mousse, berries and a three-foot piece of bacon. Favorite website: Fun 4 the Brain, a site featuring math games, finished first with 20 percent of the votes. But an equal percentage of kids wrote that their favorite website was . . . nothing. They just didn’t spend much time online. Second place went to the video site YouTube. Favorite club or hobby: There was a three-way tie for first in this category: math, art and computers. Other answers were Junior Architect, Study Buddies and having sleepovers. What do you want to be when you grow up? Scientist was the top career choice, with several specialties mentioned (chemist, physicist, and plants and animals). Doctor received two votes. Other interesting future jobs: art store owner, horseback rider, business developer and comedian. Click here to see the KidsPost article. If you’re looking for a private school that’s different from all others, then look no further—Nysmith School for the Gifted is the school for you. Nysmith is different than any other school in the Washington Area. How so? Take a tour of Nysmith for yourself, and you’ll be hooked. Families commute from Bethesda MD and Arlington Counties each day to provide their children with a Nysmith education. The fact that several families have sold their homes, quit their jobs, and moved to the area specifically for the children to attend Nysmith is a statement other schools can not say. While Nysmith has been ranked Top 10 in the World by Johns Hopkins CTY Talent Search and Top 1% in every category on IOWA Standardized Testing and received a Tommy Award from TJHSST, nothing compares to the fun that the children have while learning to their highest potential. Nysmith diversifies the academics to meet the needs of the children—they don’t simply teach from a prescribed text. The Nysmith School diversifies the academics to help each child succeed at the level that they are ready to learn without pressure. Reading and math classes are differentiated up to four grade levels above grade. The students change classes with each subject to allow teachers to teach the subjects that they are most passionate teaching. That passion and depth of knowledge translates into a fun and energetic program for the students. The daily curriculum consists of reading and math, hands-on science, hands-on technology and computer instruction, foreign language, social studies, and either physical education or music each day. The goal of the Nysmith School is to make school fun. One of the ways that the Nysmith School is different from other schools is that it minimizes the repetition both in the classroom as well as at home. The benefit of minimizing the repetition is that not only does it reduce the student’s boredom, but it also allows more time for deeper analysis and more thorough investigation of the content. Parents Can Join in the Fun, Too! Parents often help with community service projects such as the Special Olympics, making sandwiches for Martha’s Table, blood drives, and International Day, to name just a few. Parental involvement ensures that students witness what it takes to get involved, become responsible citizens and understand their importance in society. The award winning Nysmith School in Herndon is a family-owned and operated private school with over 550 students from three years old – 8th grade. The Nysmith educational philosophy is based on low teacher/student ratios, loving teachers, creative problem solving and individualized, accelerated programs for reading, math, daily science, computers, logic, foreign language, and much more to make learning exciting. Nysmith tells the Patch about the Nysmith School’s teaching philosophy and his favorite meal in the cafeteria. Kenneth Nysmith explains where his interest in education originated and talks about some of the more popular extra-circular activities the Nysmith School for the Gifted offers. Patch: What is your school best known for? Ken: The Nysmith School is known for making school fun, diversifying the reading and math levels up to 4 grade levels above grade, and it’s STEM program. Patch: What’s the best item in your cafeteria? Patch: How did you get into teaching or education? Ken: Nysmith is a family owned and operated private school. I grew up about teachers, and enjoy working with children in a happy environment. What is your favorite event at the school? Ken: My favorite event is probably Halloween. Excitement is always in the air at Nysmith, but add in the children and teachers in costume, and you have magic. I must admit, I love my job. There are very few days that I do not look forward to coming to school. Patch: What was the best advice a teacher ever gave to you and do you remember the grade/subject he or she taught? Ken: I really do not recall which of my many wonderful teachers gave me the advice, but the advice was to always try my best and not to compare myself to other children. Patch: What advice would you give others in your position? Ken: Have fun, encourage others to try their best and enjoy the adventure. Everyone has good in them, the more you look for the good, the more good you will see it them. Begin the positive cycle. Patch: What’s the school’s teaching philosophy? Ken: Nysmith believes in minimizing repetition, both in the classroom as well as homework. We work hard to make school fun for the children. Patch: What are some of the more popular extra-circular activities? Ken: I think our bouldering club is one of the most popular after school clubs. We have about 55 clubs each week, so there is a lot of variety. Patch: What makes The Nysmith School standout? Patch: How can readers contact the school or learn more? Ken: We have a lot of information on our website www.nysmith.com, we have tours every day as well. The Nysmith School was featured on WTTG – Fox 5 DC – check out what the buzz was about! NBC4 Washington featured The Nysmith School in their broadcast in December 2015. Local radio station WNEW 99.1 covered our “Star Wars Day,” when teachers put a Star Wars spin on lessons, and teachers, staff and students dressed as their favorite movie characters. In science classes, for example, students learned about “The Force” — the centrifugal kind. Most school field trips take in a museum, maybe a visit to a historic house or possibly a kid-centric performance of some kind. All of these outside-the-schoolwalls outings are great experiences and terrific educational opportunities, but a group of students from The Nysmith School in Herndon got a real treat when they visited the Reston offices of FireEye, a leading developer and provider of cyber security products and services. AN HOURS-LONG VISIT to an office building might not sound like a lot of fun to your average sixth, seventh and eighth graders, but these youngsters were beside themselves because all of them are members of a Nysmith CyberPatriot Team and this was a chance to see the hypotheticals that they work with come to life before their very eyes. The CyberPatriot National Youth Cyber Defense Competition is part of the Air Force Association’s (AFA) STEM (Science, Technology, Engineering and Mathematics) Program, aimed at encouraging interest in these areas of study and developing the skills to pursue related careers. 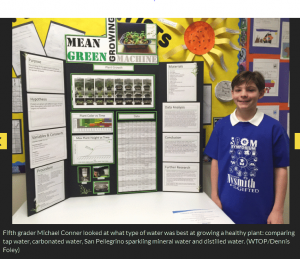 As a school that is known for its excellence in STEM education, Nysmith has embraced the STEM curriculum, and its students have equally accepted the challenge of the competition. One of the two Nysmith teams entered into last year’s competition took the Middle School National Championship – no small feat when you take into account that more than 2,150 teams were registered from middle schools and high schools from all fifty states, Canada, and DoD Dependent Schools in Europe and the Pacific. In the competition, the team members act the part of newly-hired IT professionals tasked with finding and fixing vulnerabilities in a number of operating systems with two major ground rules: cause no further damage to the virtual systems and do not cause additional problems for the imaginary users. “And that’s pretty much the same mission for FireEye in the real world,” said David Lindquist, an Event Analyst at FireEye and one of several presenters on the Nysmith visit agenda. 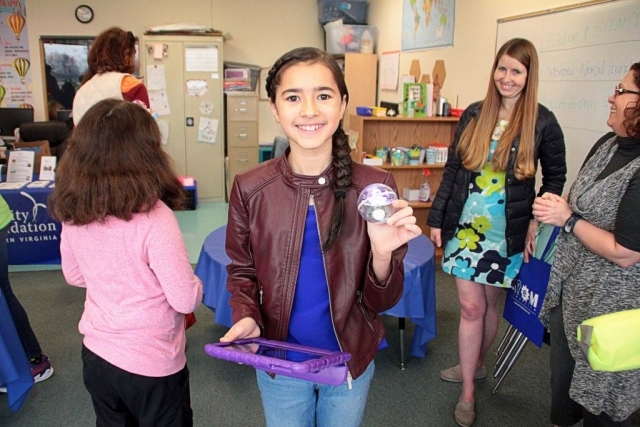 “That is so cool,” declared sixth grader Ilse Dubert, a first year CyberPatriot competitor. “It shows that the examples and problems we are given are real.” Ilse’s twin sister Annica is also a Nysmith CyberPatriot and was an attendee at the FireEye field trip. Part of the FireEye discussion addressed the skills needed to work in cyber security. “We have a shortage of skilled people in these critical fields today,” said Sridhar Jayanthi, VP of Engineering at FireEye and one of the hosts of the school tour. “Cyber attacks are a daily event at all levels, the threat is real and growing.” This group might be a bit young to be considering their career options at FireEye anytime soon, but there was a definite gleam in the eyes of the two George Mason University students in attendance. Juniors Jessica Miers and Alex Handley are the mentors of the Nysmith competitors. In a day filled with high points, the visit to the Reston Security Operations Center (SOC) was still a real standout for the young “cybernauts.” Escorted into the “heart of threat monitoring,” the visitors were corralled into one area of the room. “Sorry. This is a No-Wander Zone,” Lindquist informed them. No one seemed to mind as they watched the enormous multi-screened wall map showing samples of cyber threat incidents that looked like the scene from the movie “War Games” when the sentient computer is trying out nuclear attack scenarios for potential outcomes. IT TOOK SOME DOING to tear the group away from the SOC, but eventually they gathered once again for the last presentation of the day – and this one was no let down, even after the SOC experience. Alison Cramer, Facility Security Officer and the day’s chief liaison, spoke to the Nysmith contingent about the non-cyber aspects of security. Just like the “techie” talkers before her, she brought her topic home for her audience and kept their competitive edges sharpened, breaking them into groups to work on a “daily defense” project. “Take today’s lessons. Think about your school and look for ways to improve on the different areas of security,” directed Cramer. Less than five minutes later, each group was ready to make their recommendations. No doubt they will be presenting them soon to school principal Ken Nysmith. The 2016 CyberPatriot Competition Nationals will take place on April 10–14 in Baltimore. 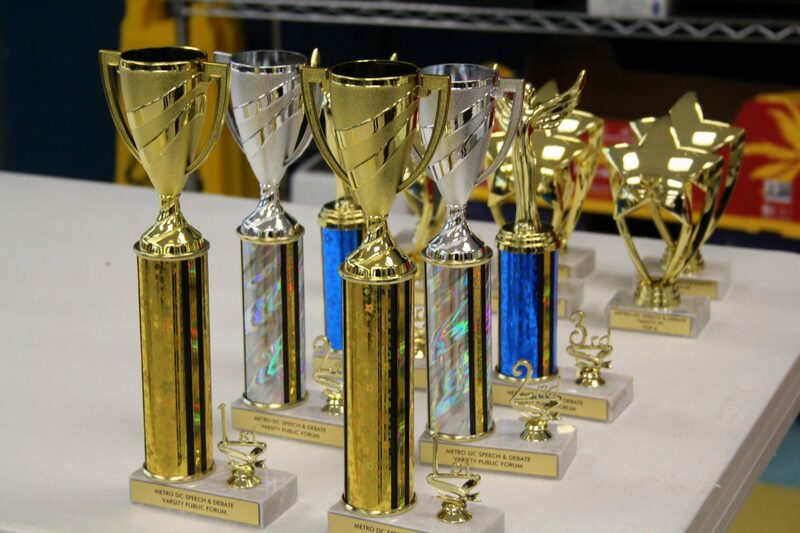 May 20, 2015 — The school year is coming to a close – but that doesn’t mean there isn’t time for the students at the Nysmith School in Herndon to squeeze in a few more competitions and maybe a trophy or two before that last bell rings. Eighth grader Shaan Bhandarkar did his school proud recently, being one of only four students from Fairfax County to reach the “You Be the Chemist” State Challenge in Suffolk, Va. Presented by the Chemical Educational Foundation, the competition is a national contest that encourages students in grades 5-8 to explore chemistry and STEM (Science, Technology, Engineering and Math) concepts. The contest is in a quiz-bowl format, and the students take on the challenge as individuals, rather than in teams. Going at it alone didn’t seem to phase Bhandarkar as he made his way through the practice, school and regional rounds to the state event, answering the series of question with only 10 seconds allotted for each one. While Bhandarkar wishes he could have taken the state crown and advanced to the nationals (“I would have liked to have done that and gone even further for my school and all the people who supported me”), his reasons for entering the competition were more personal and long-term than the first prize title. “Even at the Thomas Jefferson High School for Science and Technology, a top-ranked magnet school, senior Pooja Chandrashekar stands out among her brainiac peers. She’s got a 4.57 grade-point average, scored a 2390 (out of 2400) on the SAT, and aced all 13 of her Advanced Placement exams. She also founded a national nonprofit organization that encourages middle-school girls to participate in science, technology, engineering and math (STEM) programs. She’s also developed a mobile app that analyzes speech patterns and predicts with 96 percent accuracy if a person has Parkinson’s disease. 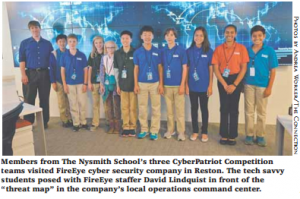 Middle school students from Nysmith School in Herndon may one day keep companies — or even countries — safe from cyberattacks. A Nysmith team placed first in the middle school division of the CyberPatriot Competition’s national finals, held at National Harbor on Saturday. The team had to identify weaknesses in a virtual computer network and eliminate them. The kids also had to defend against a virtual cyberattack and safeguard the system against future attacks. 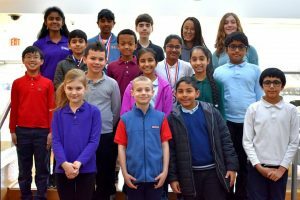 Team members were William Tan, 14, and Bhavjeet Sanghera, 12, of Great Falls; Monica Saraf, 13, and Aryaan Hussain, 12, of Herndon; and Ryan McCrystal, 11, of Leesburg. The competition is part of the National Youth Cyber Education Program. The security of the internet is a hot topic in the news these days – think hacks into retail credit card data, student identification and information, personal correspondence a la Sony, and even more worrisome, infiltrations like the recent “CyberCaliphate” hacking into the Twitter and YouTube accounts of the U.S. Central Command. With the way technology is becoming irrevocably intertwined with all aspects of daily living, there’s no doubt that it’s a topic that will only continue to demand our attention. More importantly, it will require a large population of educated, creative and computer-savvy problem-solvers to deal with the problems and defend our cyber security. So it makes sense to start the education and recruitment process early to address not only the needs of today, but also the growing needs of tomorrow. That is exactly what the Air Force Association (AFA) aims to do through their CyberPatriot National Youth Cyber Defense Competition (CyberPatriot). CyberPatriot is the organization’s flagship STEM (Science, Technology, Engineering and Mathematics) program, dedicated to encouraging interest in and the study of STEM subjects and strengthening these skills in our youth: 2014 marked their seventh competition season and drew a record number of entrants. 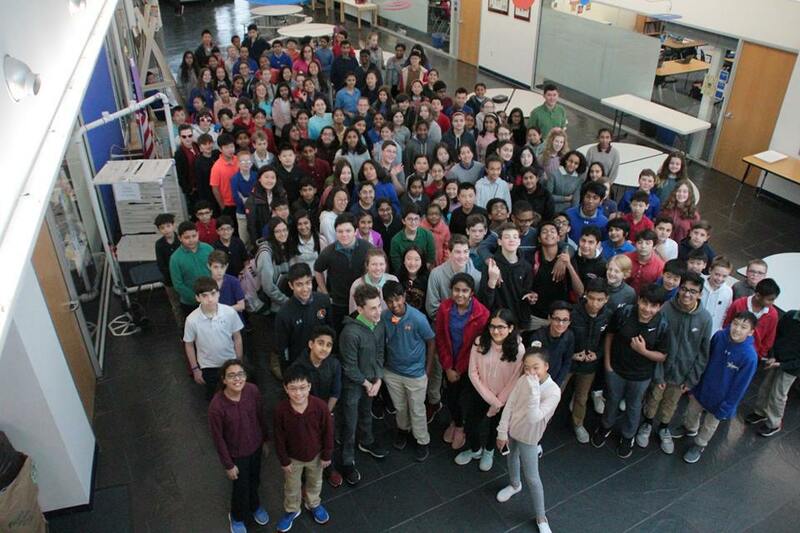 More than 2,150 teams registered from all 50 states, Canada and DoD Dependent Schools in Europe and the Pacific – including two teams of enthusiastic middle-schools students from The Nysmith School for the Gifted in Herndon, who graciously agreed to an interview for The Connection with the supportive consent of school Headmaster Ken Nysmith. Seventh grader Aryaan Hussain of Herndon and a member of Team 1, came across information on the competition at a booth at a STEM symposium at about the same time as Nysmith parent Bonnie McCrystal did. “I am always on the lookout, scouting for opportunities for our kids to grow and expand and see that what they learn has a place in the real world,” said McCrystal, who was so excited about the challenge that she became the coach of Team 1. School-wide emails and other communications were released, and before long enough students had committed to the lengthy competition process to form the two teams, the one coached by McCrystal and captained by eighth grader William Tan of Great Falls, and Team 2, coached by Praveen Bahethi and captained by another eighth grader, Sameer Bahethi of Lansdowne. And a lengthy and involved process it is. The two teams brought different approaches to the challenge, but both started with the same goal; “Do the best we can for ourselves, our team and for our school,” declared Team 2 member Restonian Khinezin Win who, by her own admission “didn’t know that much about computers before I got onboard.” Nor did either team leave anything to chance. “We had a game plan, right from the start,” Captain Tan stated. Tan’s Team 1 went straight for the “READ ME” files and dissected them fully before taking action. Bahethi’s Team 2 decided to start each contest by updating each system to ensure the most stable versions before beginning their search for the security flaws. Both also employed a “divide and conquer” strategy, assigning pairs of team members to two of the three “images” and one person to work solo for awhile on the third “image.” In order to keep the creative juices flowing and to provide the proverbial fresh set of eyes to the problems before them, there would be occasional member rotations. “It seems like you always got stuck at around 80 percent,” said Team 2 member Host. “It was good to change it up a bit. Moving people around helped us get going again and gave us some new ideas,” Host added. What else did the young competitors do to keep themselves going during each marathon session? “There was always food!” Hussain, Tan, Host and several others declared in unison. “And our parents were really supportive, making sure we had the space to do the work without too many interruptions and that there was food when we needed to take a break,” acknowledged Hussain. Some distractions, however, were apparently quite acceptable. Team 2 Captain Bahethi said that his younger brother’s presence during their efforts was welcomed by the group. 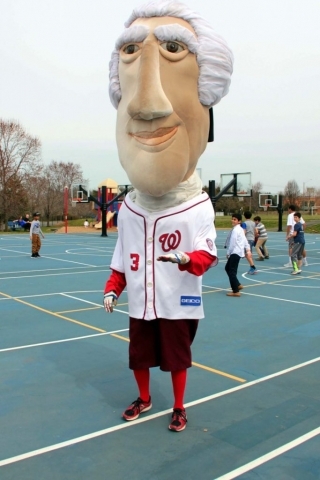 “He kind of became our mascot,” said Bahethi. Both teams also agreed that a bit of scorekeeping as they went helped to keep their spirits up. When a team scores points for identifying and correcting a security issue, there would be a “Super Mario video game type sound,” said Team 1 Captain Tan. “That would give us a huge boost! We lived for that sound,” he said. “When we finished something that we just knew was right we all just waited for that sound.” Apparently, nerf ball fights and ice cream interludes also helped relieve any tensions and keep everyone focused. More than that, the team members were unwilling to disclose. After all, “What happens in my basement during the competition stays in my basement,” laughed Monica Saraf, a seventh grade member of Team 1, whose home in Herndon was Base Camp for her team. So, what was the outcome of all of this hard work and hours of dedication? It was pretty spectacular, and something that had Headmaster Nysmith and Coach McCrystal beaming with pride. The results from the semi-finals are in and Team 1 scored First Place among all participating Virginia schools and Second Place Overall in the Middle School Nationwide Division. Team 2 took home third place honors for Virginia Schools. As a result of their semi-final scores, Team 1 will now move on to the CyberPatriot National Youth Cyber Defense Competition Finals to be held March 11 – 15 at the Gaylord National Conference Center. National recognition and scholarship monies await the winners, thanks to the generosity of sponsors like Northrop Grumman Foundation, USA Today Education, Cisco, Leidos and many others. AND AFTER ALL is said and done, what do the young members of Nysmith School’s CyberPatriots Team 1 and Team 2 want the world to know about the competition and what it has meant to them? Coach McCrystal had the last words before the interview session ended with her stated intention of seeing the Nysmith School take 1st, 2nd, and 3rd Places in the next CyberPatriot Competition. For more information about The Nysmith School, visit their website at www.nysmith.com. Complete details and resource materials about the Air Force Association’s CyberPatriot Program, STEM Outreach and competitions are available at www.uscyberpatriot.org. Nysmith alumna Satvika Kumar founded Learning Pathways Project (LPP), a nonprofit organization dedicated to empowering, educating and leading young girls in science and technology and reduce the gender gap in STEM education. The organization grew from the creation of an app that fosters long-term retention instead of rote memorization. LPP was developed further and evolved to incorporate more creative tools that would help students learn and actively engage in these STEM related areas. LPP now educates and empowers young students using multiple modalities such as mobile applications, and interactive e-labs for learning. To read the full article from Washington Exec, please click here. The Nysmith School for the Gifted was chosen as the Best Private School by Loudoun Times-Mirror readers! Carole Nysmith talks about the school she started 30 years ago that has grown and is thriving. Carole Nysmith sat in her office on the 13-acre campus of Nysmith School for the Gifted in Herndon and thought about the school’s humbler beginnings. The private school opened in 1984 in the original Reston Visitor Center, “a perfectly round little building” just big enough for the original 55 students, she said. “We had the map of Reston still on the wall from when it was the visitor center,” said her son Ken Nysmith. Ken Nysmith, 52, is headmaster of the school, which — after several moves — ended up in its current home in 2000, where it serves more than 600 children. Carole Nysmith, 78, who founded the school, holds no formal role although she still keeps an office there and frequently gives tours, visits classrooms or walks the halls checking on students. Before founding the school, she was a teacher at Sunrise Valley Elementary in Reston, where she enjoyed teaching students in the Fairfax County school system’s advanced academic program. But she wanted to offer advanced academics to students in kindergarten, first and second grades who were not served by the county’s advanced programs, which started in third grade. She scraped together money from her and her husband’s savings and borrowed money from her two sons to start the school. “I think back sometimes, and it kind of surprises me that I had the nerve,” Nysmith said. To recruit students, she would put ads in local newspapers and hold talks at the Reston Community Center. Nysmith School opened with six teachers in kindergarten, first and second grades. See a PDF of the full article here. Nysmith School challenges students at the level they are ready for. To those families whose K-8 children are now or previously were enrolled at The Nysmith School for the Gifted in Herndon, the school combines exceptional academics with “serious fun” to create an environment in which the children are motivated to stretch to their limits and maximize their potential. 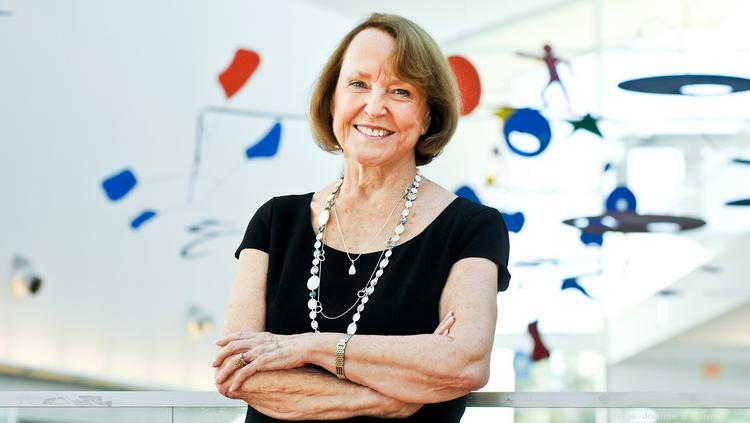 It was Carole Nysmith’s (Reston resident) vision and educational philosophy that laid the foundation for the school. From Kansas to California to Virginia, her professional career found her learning as much as she was teaching children with the capacity to do more in the classroom. Nysmith discovered that many children were “turned off by education” and that if you tried to teach children something they already knew they would quickly tune you out. 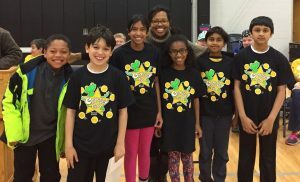 While she enjoyed teaching at Sunrise Valley Elementary School in Reston and working with “gifted” children in Fairfax County’s Accelerated Academics Program (AAP), Nysmith realized the importance of challenging them at the level they were ready for intellectually. She recognized the value of teachers having the flexibility to deviate from a standardized curriculum and of students being placed—and taught material—several grade levels above their age. Convinced of the need to allow students to learn at a rate that matched their individual capabilities, Nysmith decided to create her own school, one that would provide students with the opportunity to learn at whatever pace was right for each of them. As Nysmith describes it, she sold everything she and her husband owned and even borrowed some recently-inherited money from her two sons, one of whom (Ken) serves as the school’s headmaster. She gave weekly talks at the local community center and anyplace else she could get parents to listen to her. To this day, she remains amazed that people were willing to sign up their youngsters and provide enrollment deposits when there was not yet a building that would house these eager-to-learn students. The Nysmith School for the Gifted (www.nysmith.com) opened in 1983 at the Reston Visitor Center, one of seven locations to house the school in its first few years of existence. There were 55 K-2 children and six teachers that first year; grades 3-6 and a preschool program were added in the late 80s and early 90s as enrollment was doubling every year. The school was so popular that parents of the sixth graders essentially told Nysmith that “they refused to leave” Nysmith and insisted that she add an intermediate level (7th & 8th grades), which she did in 1989. Today there are more than 700 students (some of whose families moved to the D.C. area just so that their children could attend Nysmith) and 150 teachers making the most of each day on the 13-acre campus. What’s the secret to the school’s success? Certainly part of it is the quality—and the continuity—of the teachers, all of whom are interviewed and selected by Nysmith. And the teacher to student ratio of 9:1 is as remarkable as it is conducive to presenting as many as four different levels of a subject in a single grade to accommodate each child’s needs. Promoting learning as being both fun and intellectually challenging is not just Nysmith’s philosophy; it is the essence of the experience that exists within the walls of the school. Nysmith students consistently place in the top 1 percent in the country in each category of the standardized tests. Many compete successfully in various local and regional competitions—and a team of 7th graders won third place in the World at the Odyssey of the Mind World Finals in Ames, Iowa earlier this year. Carole Nysmith and two 8th grade students, Olivia Kaczmarskyj and Anika Schipma, speak about the importance of STEM education on “Let’s Talk Live” on WJLA ABC7 Washington. Improving the way our students learn these subjects can close achievement gaps and produce innovation. Her mother a teacher, Carole Nysmith, in those days, had few options herself by the time she chose a profession. Since then, Nysmith put 50 years of teaching under her own belt. In 1983, she started a private school that focuses on science and technology, one with 600 students and 140 teachers now, so that girls graduating today have loads more career choices than she did. Biggest current challenge: Getting people to come and visit the school and see what these wonderful teachers do. They are very unique teachers. They are very devoted to the children. They constantly go take classes so they can come up with new ideas. It’s fun to see what you can accomplish with children. Next big goal: I’m happy where I am. We don’t want to do a high school. We thought of eventually opening another preschool out farther, but we’re happy with what we do. We started with six teachers, and it took me years to build this staff. If I were to go out and start another school, I would have to go find another 10 fabulous teachers, and that’s really hard to do. Biggest misconception about private schools: The biggest misconception about gifted schools is they think these kids are very different. You wouldn’t be able to tell them apart except they have good behavior. What do you say to criticism about pushing kids too hard? You do not push children. But you open up opportunities. You may have a 4-year-old who reads on a second-grade level. We don’t put them on a second-grade level, their reading puts them there. We just go where the children go. We have children coming out of eighth grade ready for Algebra 2, Pre-Calculus. We cater to every person’s strengths. We might entice them. We might tempt them. We start our frog dissections in the fourth grade. Your definition of gifted: A child who is bright and interested in learning and learns on a higher level than average. A key ingredient in getting kids interested in STEM: Science. I saw a class of young children, and they were using flour and water. They were finding out what happens when you put flour in the water and what happens when you bake it into a cookie. They come up with all kinds of clever ways to teach science. They use all proper terminology, and if the kids pick it up, that’s great. I think where their eyes really glitter is getting into science and what they can really do. What would you change about standardized tests? My biggest concern is we are forcing teachers to teach to the test instead of letting the children learn the way they’re able to, to move up. It kills me to listen to the teachers talk about getting everybody reading on a certain level and do math on a certain level. What are you like to work for? I try to find the strengths in each of my teachers, and I have extreme loyalty to them. Best lesson from your mentor: Being a mentor to others. Whether you’re a student or adult, there’s always someone who needs your help. And it’s your job to go over kindly and help them. We teach that to our children as well. Best business decision: To start this school. I like to think one of these kids will be president. Hardest lesson learned: Probably you can’t win every game. We take some children that have disability. You can’t always win. You try. What keeps you up at night? I don’t really worry about it. It seems to take care of itself. You worry about individual children. You’re constantly trying to come up with new strategies on how to reach a child. But overall, no, nothing. Most memorable student: I went over to Thomas Jefferson and listened to one of my former students, 17 years old, talk about her research. She’s come up with a patch to help the heart, and she hasn’t even gotten to college yet. What would you change about your job? Other than becoming younger? The thing in general that worries me in the world these days is how we’re going toward paper. We’re not relying on the children. We’re relying on the test scores. When they go to college, it’s all about the paperwork and how many AP classes. We, of course, don’t give grades in the lower grades. We don’t do standardized testing. We do the Iowa test — it’s a national test — at fourth and sixth grades. Your earliest memory: When I was little, I used to play teacher. I had my own little chalkboard. Your best subject growing up: I loved reading and writing. Your worst subject growing up: Probably math, which is why I want to be sure the kids love it here. Because I didn’t love it. Guilty pleasure: Having an ice cream, probably chocolate. If you had $1 million, you would: Start a preschool, of course. Businessperson you most admire: These people opening up these electronic places, the laptop-type places. All of these people doing all these wonderful new things with electronics. Those are the people who fascinate me the most. Your go-to karaoke song: No, quiet people don’t go there. What did you want to be when you grew up? I look back now and think, “Hmmm, it would have been fun to be a marine biologist,” but I like being a teacher. I remember my mother saying sometimes the most mischievous child in your class is the most fun child. I understand what she’s saying. Favorite book: I like reading mysteries. I can completely shut out everything else. I read the books I’m supposed to, but I really enjoy reading mysteries. What would you do if not this? I probably would go into something people-related. Favorite hobby: Besides reading, of course, I like doing stitchery. Make something for the kids — you can do pictures or cross-stitch on dresses. Favorite place outside of the office: I loved Hawaii. I think I loved the flowers, and it just had an atmosphere about it. You felt it was not quite real. What do most people not know about you? They probably don’t realize how really quiet I am. When you’re working around kids and parents, you’re very outgoing. I think I’m basically a very shy person. Once you get to talking about children, you forget who you are. What’s one thing you cannot do without each day? Have people around me. I don’t like it in the summertime when the kids are all gone. Pet peeve: People who text and talk on the phone when they should be paying attention to children. I especially get upset when they come through the lines and they don’t even say anything to the children when they pick them up and put them in the cars. They should be saying, “How was your day? What was your favorite part?” But they’re just on their phone. What’s on your iPod? I like old-fashioned music. I listen to a lot of the stuff that was popular in my day. I listen to a lot of classical music too. In fact, I usually listen to the radio on one of the classical stations. The Nysmith School for the Gifted began as a humble enterprise–a few dozen children crowded into an abandoned visitors center in Reston. A decade and a half later, Nysmith has nearly 600 students through eighth grade and regularly turns away scores more who wish to enroll. The school just moved into a light-filled new building in the thick of Herndon’s high-tech corridor, hard-wired for computers and supported by some of the higher tuition rates in the region. The building’s cost: $10.5 million. Not bad for a primary school. As their public school counterparts struggle to provide enough teachers and classrooms for new arrivals, suburban private schools–especially in Northern Virginia–are being overrun. Much of the growth comes from high-technology workers and executives flush with stock options and eager to provide their children with the best education money can buy. Tuition is skyrocketing, waiting lists are growing and the competition is starting to resemble the jockeying for schools in Manhattan or the District. At one Montessori school in Reston, parents are signing up infants three years in advance. School officials say the coming year is shaping up to be another blockbuster. Applications–due no later than next month at most places–are up as much as 100 percent for some programs, administrators say. Private schools in the Washington area already turn away nearly three of every five applicants, according to the National Association of Independent Schools, and the odds are getting worse. Median tuition rates at nonparochial private schools are rising at two to three times the rate of inflation, now approaching a median of $13,000 a year for the highest grades. And many private schools on both sides of the Potomac are dusting off shelved plans for expansion and launching fund-raising campaigns to tap into the newly created wealth of the technology economy. But the clearest indication of the high-tech economy’s effect on education can be seen in the number of new, computer-oriented schools such as Nysmith that have sprung up in Northern Virginia. Take Flint Hill School, a 10-year-old, all-grades school in Oakton that just purchased 30 acres for a new upper-school building. When completed, the additional location will cost $10 million to $15 million. So far this year, applications at the 650-student school are double what they were in 1999. Ruth Little, the school’s admission director, said Flint Hill and its peers consciously woo parents who work in the region’s technology sector, in part by highlighting their use of computers and the Internet in the classroom. At Nysmith, computer training begins in the first class–at age 3. At many schools, the fiercest enrollment pressure is coming in lower grades, reflecting the youth of those rising to power at America Online Inc., MCI WorldCom and other area tech companies. In the Herndon-Reston area, for example, parents had two Montessori elementary schools to choose from five years ago; now they have seven. Eileen Dowds Minarik, founder and principal of the Sunset Hills Montessori Children’s House in Reston, said a large portion of her school’s 96 students have parents who work for AOL or other dot.coms in the area. That’s one reason that Minarik’s school has a limited number of computers, despite the traditional reluctance of Montessori programs to use them. Dozens more children are turned away from Sunset Hills for lack of space. As a result, several parents have gone so far as to enroll their infants and toddlers for preschool–two and three years ahead of time. Anthony Nuti, a computer network engineer from Centreville, is in the process of returning his three children to Nysmith after a brief sojourn in the public schools for financial reasons. But unlike five years ago, when his oldest son first enrolled, getting back in has taken patience. After securing a spot for his oldest son, Nuti finally nabbed an opening two weeks ago for his other son. His 8-year-old daughter is still on a waiting list. Meanwhile, prices have gone through the roof. Five years ago, Nuti said, it cost about $9,000 to enroll his son. The same child today would pay about $12,000, and those in the upper grades pay more than $14,000, school officials said. Like his peers who have children at other private schools, Nuti was drawn to Nysmith largely because of rigorous academics. From kindergarten on, children proceed to different teachers for different subjects. There are two teachers in every classroom, many of them certified for college-level instruction. But there is another, equally strong allure: Nysmith is devoted to new technologies and new methods of teaching. No ivy clings to its new brick-and-glass walls. Nicole Mitter, 11, transferred to Nysmith from the well-respected Congressional School in the Falls Church area when she was in the first grade. Computer consultant Eva Mitter said she and her daughter chose Nysmith because it is less traditional. Carole Nysmith, a longtime teacher of gifted students in California and Fairfax County, started the school 16 years ago with three rented rooms and 55 students from kindergarten through second grade. Enrollment has grown to 553 students from preschool to grade eight. There are no plans for an upper school yet.